Beautifully engraved cancelled Certificate from Command Airways, Inc. issued in 1968 - 1970. This historic document was printed by the Hasbrouck, Thistle & Co. and has an ornate border around it with a vignette of an allegorical woman next to a globe. This item is hand signed by the Company's President ( Kingsley G. Morse )and Secretary and Treasurer and is over 32 years old. The certificate has void written across it to show its cancellation. 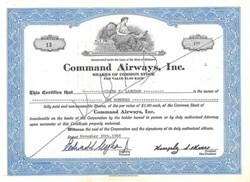 In 1986, Command Airways became part of American Eagle. 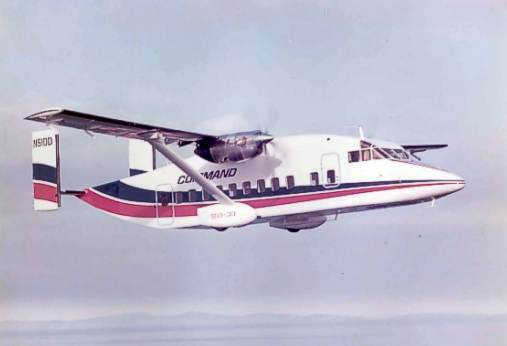 In 1991, the company became Flagship Air.